My dear friend Suzy is hosting a month long Mirror Image Event. Everyday this month members from the design teams of So Suzy Stamps, The Ton, and My Sweet Petunia will be posting cards made with Suzy's Mirror Image Stamp. We will have the entire list with links to everyone's post on the So Suzy Stamps blog so you can go back and see the inspiration on a daily basis. Suzy will also be sharing the cards on Facebook and Instagram, just in case you miss a blog post. We have prizes from My Sweet Petunia, The Ton, So Suzy Stamps and Simply Charming Everyday. Some time ago I contacted Suzy to ask her to create a full A2 size Mirror Image Stamp that would work in the MISTI. If you are not familiar with the what a Mirror Image Stamp can do, let me explain. If you have an image and it is facing the wrong way, you can use the Mirror Image Stamp to flip your image. Still not sure? I have a video for you below. Thanks so much for stopping by. Don't forget to subscribe to our blog and YouTube Channel. Have a great day, it's the only one we have! Sweet card with the owls! Very handy to have the Mirror Image Stamp! Love the plaid paper background and the color combo! Love the video! Thanks for your time in sharing it with us. Love the owls, too cute. I swear, Ilian....you are a genius! An amazing card and your video was truly inspiring! Thanks for sharing it and I am excited to now learn this is a month long event! YAY! What an adorable card. Thanks for showing us the mirror stamp. I think that might come in handy! Can't wait to try this technique! The owls are so cute and the colors work together. Such a cute card! Love the mirror technique and how easy it is to use with the Misti! Thanks for sharing your technique. Such a cute card. Love the plaid background. I need to try this technique. I just love your mirrored owls !!! too cute!!! Adorable card. Thanks for the tutorial on how to do mirror stamping. This technique will be very useful. What a hoot! I just bought these stamps and can't wait to get home and use them, I am loving the mirror images! The owls are so sweet. Love the colors and the background paper. What a precious card, Iliana! The mirror stamp is genius! Awesome! I couldn't figure out why you were stamping the back of the card stock until you used your die! I so need to try this! Thank you for sharing this technique and thank you for offering such a fantastic giveaway. Wonderful. I am assuming that you die cut the owls one facing up and one down. Yes? How cool. I need to get this. Love those cute owls! Love the mirror image! Love the card and information on the mirror stamp. its a super beautiful card! Love it. A different way to use the mirror image stamp. Love to have choices. Adorable card! You make it look so easy, guess I need a mirror stamp! Love it! Adorable card, the mirror Stamp is awesome, I always goof up when I use acetate, thanks! love the easy way to create a mirror image. great video!!!! A very cute card. Always love owls. Love your adorable card. Thanks for sharing your idea. Super cute card. Thank you for making the video, sharing your ideas and techniques. Lots of great Misti tips on this video. Thanks! I just bought the mirror image stamp. Can't wait to give this a try. Sweet card! Love the reverse image tips! Terrific! This effectively doubles all my stamp images that aren't symmetrical! I love your sweet owl card. This is too sweet! Thank you for sharing. LOVELOVELOVE this adorable card!! Cannot wait to see what the designers create over the month!! I know it will be very inspiring!! See you tomorrow!! The owl is so cute in either direction, so many stamps I could use this technique with! Glad I have my Misti! I LOVE these adorable owls! Super cute and really whimsical! The mirror stamping is so genius! Another great way to use the MISTI! This technique is really great = I already placed an order for the mirror image stamp ! Lovely card, as usually, thank you for giving us the opportunity to win fabulous prizes ! Iliana, this is way too cute! What a great technique! Thank you for a great video on using the mirror stamp! Love the cute little owls too. Oh, this is so sweet. Love the cute owls... great technique... love the mirror image! Iliana, your card is precious! I also found the video to be very helpful. Thank you for sharing! Such an adorable card! Thanks for the great tutorial! So sweet, Iliana! I really love the plaid colors of your card base. Thank you for sharing your video. Such a sweet card, Iliana - the owls are adorable! Thank you for sharing your video. You can't get any sweeter than a card made with Lawn Fawn products! Fabulous card, the owls are adorable and I am LOVING the mirror image stamp!! Adorable card and thanks for all the tips. Love th card. Thanks for sharing the mirror stamping technique. MISTI make so many techniques and ideas easy! And the mirror image stamp adds even more to it. Thank you for the tutorials! Adorable card, love the colors you used for the darling owls. Thanks for the tip on using your dies on the mirror image, so simple yet I didn't think of this. :) Thanks for being a sponsor! So cute and adorable. I need to try this technique. Love your card. Such a great idea! Love this mirror image technique. Your card is so adorable! I am really liking this mirror stamp. It opens up so many possibilities! Mind blown!! What a cute card. The two owls are adorable. I just love this adorable card. The owls are so cute. I love how you created this couple of owls! So cute! 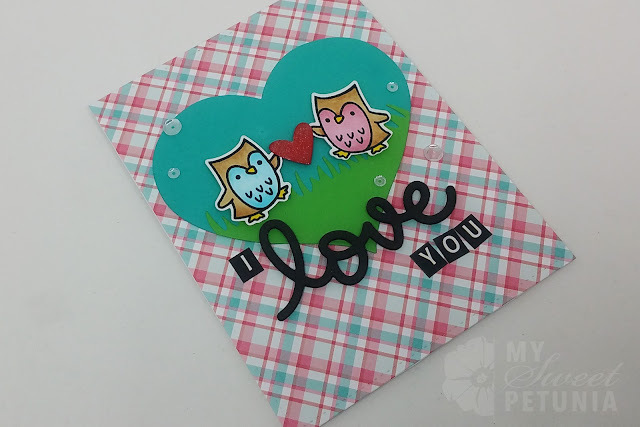 Just love those owls and the mirror image stamp with the Misti just makes it look so easy!! Just beautiful!! Really cute card. Thanks for the technique share. This is so cool and I am glad you hall have developed this rubber to use. It will sure make things easier for getting a crisp reverse image. Your card turned out super cute. Fun to have a way to make a couple now! Great tutorial! Very cute card. Mirrored image for Valentine is such a good idea! What a fun trick to die cut your reversed stamped image. And yes! I hate those indentations when you die cut. Thanks for the tip! Cute card. I love this idea. I've always wanted to know how to mirror stamp. Thanks! Love it! The stamp and MISTI make it so much easier to get the mirror image!!! Super cute card. I just adore these stamps and plaid paper. Love the tip to stamp it on the back of the paper so it makes it easier to die cut! Never would have thought of it-thanks! Love the owls and the mirror stamp possibilities. I am going to be broke before this is all over. Such a cute card. Thanks for the video. Love your card as well as your informative video! The. Little owls are so cute. Love the Mirro Image stamp. Thank you for showing this process. That is one adorable card. So cute! The plaid paper is the perfect backdrop for these sweet love owls. What a sweet card! Love what a mirror image stamp can do to make a cute card even cuter! Thanks for the inspiration! I'm glad you showed how to cut the reverse item with a die cut. It seems so simple to just cut it from the backside, but I goofy brain certainly didn't think of it. Adorable Card!! The uses for this mirror image are endless! This card is so cute!! I can't wait to try the mirror image stamping! And thank you for the great tip about the typing paper when die cutting! Cute card! I love the over stamping and will have to try it. Great tutorial!!! Thanks you for the step-by-step and also providing a list of items used. Iliana .... I know the video was for the mirror image stamp, which in itself is awesome, but I learned so many tips from your video. The restamping the image to get the detail was amazing. Never thought of that. Adorable card. You Rock!! What a great idea! I love my MISTI and this is one awesome addition to it! Your owl card is such a hoot! Your card is super adorable! I love the way you mirrored the owl. Aww his and her owls! So cute! Thanks for sharing instructions and your cute card! Simply gorgeous methods!! So going to buy these stamps sets too! wink! wink! What an adorable card! Love the little owls! This card is so super sweet, absolutely adorable! Really awesome tutorial, I love how you re-stamped the owl after you had coloured her, it really made big difference, I am gong to try that! Adorable! Really need to try this! to be able to pair them up. Such a cute card! Can't wait o try the mirror immage stamp! Great card, I love the colors! Mirror stamping is such a fun technique. Cute card. Love this technique. Have to have the mirror rubber. Cute card - love the plaid paper. The owls are so cute! Thanks for not only showing us the mirror imaging you did but how you went back and re inked the last owl. Great to learn. Thank you! This is adorable!!! The image is so cute in both directions! : ) And I love your plaid background. The Misti and a mirror image stamp are THE perfect combo! adorable card :) have to give mirror image stamping a go, looks so cool. thanks for sharing ! Love the card and love the mirror image! Super cute!! I am so very glad you guys are covering this technique. I tried my hand at it and LOVE the technique.. Such sweet little owls! ❤️ I so love the idea of a red rubber mirror stamp. Have added it to my wish list! Such a cute card!! Love the owl! Thanks for the video! Love the cute little owls great way to use the mirror stamp. This card is adorable. I'm enjoying seeing all the creativity! Thanks for the video! Seeing it work is helpful for a visual learner like me. I love owls. Very cute card. Love the mini misti and love the owls, can't wait to try! I am loving this technique! This is just too cute. TFS!!! Great card and such cute owls. Cute card. Love the patterned paper. Thanks for sharing. Love the cute owls. I'm so glad for this blog hop on this technique. What a sweet card! Your video was great at showing the mirrored stamp technique. You just doubled the amount of Lawn Fawn images I have by using this technique! Thanks for the tips! Love the colors! the little heart in a heart and the coloring of your owls to show the difference. Sweet! Such a cute card! What I like about the mirror image stamp is you can stamp 2 of something that are interacting with each other, like these owls. If you just stamped the owl twice they would both be looking the same direction. This way they are looking at each other. Love it for that reason! Such a cute card. Do you use watercolor paper or Crafters Companion?